Florence Loretta Breaux, 88, of Painesville, died on January 13, 2015, at her home, Ivy House. She was born February 15, 1926, to the late Frank and Lillian (Trombley) Gardner in Detroit, MI. 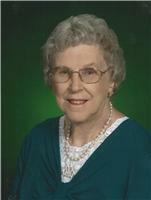 Florence was a member of First Church of Christ and the Crusaders. She enjoyed making jewelry and collecting angels. Survivors include her children, William "Billy" (Sharie) Breaux of Mentor, Christina (Clyde) Dubeansky of Mentor, and David (Valerie) Breaux of Concord; grandchildren, Bill, Michelle, Joe Allan, Paul, Scott, Tim, Christopher, Heidi, David, and Katie; 13 great grandchildren; brother, Frank Gardner of Charlotte, NC; sister-in-law, Judy Lindberg of Marysville, MI; and 1 niece and 1 nephew. In addition to her parents, she is preceded in death by her husband, William; and sisters, Marie Gardner and Doris Heinrich. Visitation will be Friday, January 16, from 2 to 4 and 6 to 8 p.m. at Johnson Funeral Home, 368 Mentor Ave. (opposite Lake Erie College), Painesville, Ohio. Funeral services will be Saturday, January 17, at 10:30 a.m. at First Church of Christ, 422 Mentor Ave., Painesville, Ohio. Burial will follow at Western Reserve Memorial Garden, Chesterland. Memorial contributions are suggested to Ivy House, 308 S. State St., Painesville, Ohio 44077. Please share your memories of Florence.